I recently had a task at work to understand a binary Linux program. However, the program was in binary form. I used the commands file, strings, and objdump to have a slight idea of what it was doing, and what functions it was calling. It seems the binary is compiled with debugging information. What more can I learn about it? Including the commands you already used, I will try my best to detail what can be done to do some forensic operations in an executable file. if compiled with debugging info or not. In this example, "not stripped" denotes it was compiled with debugging info included. 0020 61742034 2e342e37 2d313129 00        at 4.4.7-11). You may run the binary in a VM only created and then discarded just for the purpose of running the binary. Use strace, ltrace, gdb and sysdig to learn more about what the binary is doing at the system calls level at run time. strace runs the specified command until it exits. It intercepts and records the system calls which are called by a process and the signals which are received by a process. The name of each system call, its arguments and its return value are printed on standard error or to the file specified with the -o option. ltrace is a program that simply runs the specified command until it exits. It intercepts and records the dynamic library calls which are called by the executed process and the signals which are received by that process. It can also intercept and print the system calls executed by the program. It can also be debugged step-by-step with gdb. The purpose of a debugger such as GDB is to allow you to see what is going on ''inside'' another program while it executes. sysdig is a tool for system troubleshooting, analysis and explo‐ ration. It can be used to capture, filter and decode system calls and other OS events. sysdig can be both used to inspect live systems, or to generate trace files that can be analyzed at a later stage. sysdig includes a powerful filtering language, has customizable output, and can be extended through Lua scripts, called chisels. We will deal again with the static analisys of the binary file itself on the remainder of this answer. ldd prints the shared objects (shared libraries) required by each program or shared object specified on the command line. nm lists the symbols from object files objfile.... If no object files are listed as arguments, nm assumes the file a.out. Besides disassembling the binary with objdump, a decompiler can also be used. For decompiling, recently I did a technical challenge where I needed to decompile two small 64-bit linux binaries. I tried to use Boomerang and Snowman. The Boomerang project seems abandoned, and I was not impressed of the limitations of both of them. Several other alternatives, either open source/freeware/old including a recent one released by Avast, only decompiled 32 bit binaries. I ended up trying the demo of Hopper in MacOS (it also has a Linux version). 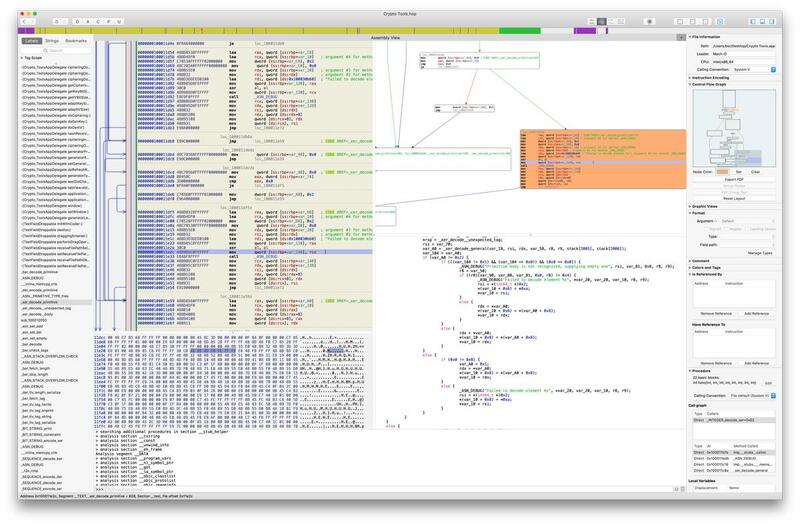 Hopper disassembles and decompiles either 32 or 64 bits binaries for OS/X, Linux and Windows. It is capable of tackling large binaries when licensed. It also makes flow graphs of the functions of/program structure and variables. It is also being actively maintained and updated. However it is commercial. I enjoyed so much using it and the resulting output that bought a license. The license is far more affordable than hex-rays by a long shot. In the comments of this answer, @d33tah and @Josh also mention as an open source alternatives radare2 plus the corresponding graphical interface Cutter being similar to Hopper in Linux, cannot vouch personally for it as I do not use them. Also, as the target binary was compiled with debug info, you may get back the original name of functions and variables. More notably, you won't ever get back the comments in the source code as they are not compiled in any way into binary executables. Improving the quality of the output source, and the understanding of the binary will always imply some time and detective work. Decompilers only do so much of the work. I also answered about Hopper here SO - What's a good C decompiler? see also the related question Why are true and false so large? Linux disk I/O performance issue — what config options to look at? learning about general logging/logrotation on linux? How to know what to grep for in dmesg?